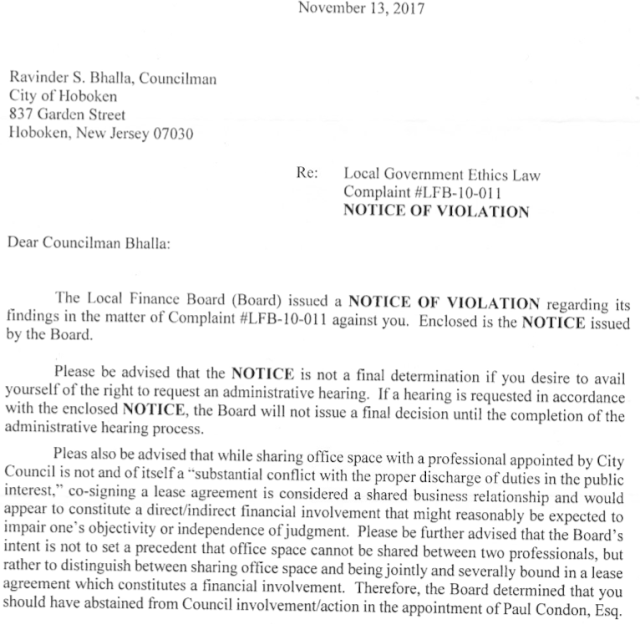 "Last night the City Council voted overwhelmingly to protect Hoboken taxpayers by stopping Mayor Bhalla from continuing to use city resources to defend himself against a personal ethical violation. This has gone on for eight years and it's clear that the Mayor's lack of candor when the situation first developed led the city down a path of being unfairly forced to foot the bill for Bhalla's indiscretion. That misuse of taxpayer funds needs to end and we're glad to see the City Council continue to act as a watchdog on this administration." Local Finance Board violation is attached as a snapshot below from the State of NJ, Department of Community Affairs.